This is a continuation of a previous post. You can read the first half here. Eventually the shaky carb flu passed. I continued to be active in the calorie-tracking website forums for a couple months. One day, I read about a girl who ate in a way called ‘paleo’. She had lost a lot of weight and looked fantastic, so naturally I was immediately curious. I dug a little deeper and I stumbled upon the blog Mark’s Daily Apple. I read about how my Standard American Diet was miles away from what we ate thousands of years ago (and even just 150 years ago!) and how everything I had been taught about healthy eating (lots of grains, low-fat food) was wrong. It was as if someone had switched on a light inside my head. I finally made the connection that food had made me overweight, depressed, and sick, and that food could reverse that, too. Everything I read made perfect sense to my logical brain. I began to read voraciously, devouring everything about ‘paleo’ and ‘the real food movement’ I could get my hands on. It wasn’t long before I decided to make the switch to paleo. I began to cut out grains, legumes, dairy and refined sugar from my diet. At first I was a little terrified because I didn’t know what the heck I was going to eat, but I muddled my way through. And my health issues that had bothered me for years began to clear up, especially my digestive problems. I didn’t realize how awful I had been feeling until I started feeling incredible. I never thought that I had any food intolerances. I only noticed when my mind was clear the extent of the brain fog that I was dealing with before. At this point, my main goal was still weight loss, but I was amazed at the other changes that were happening to me. I went back to New Zealand with my new-found knowledge. I kept making minor tweaks and changes to my diet as I read and learned more. The weight kept coming off, my skin was improving, and I was feeling better and better. My very first lamb roast over mashed garlic cauliflower! I slowly (very slowly) was learning how to cook for myself and discovering a world of new flavors! However, I soon got stuck in a pattern familiar to many who have lost weight. For a over a year, my weight was anywhere between 120 and 130 and I yo-yoed up and down between the two. I couldn’t seem to lose more weight no matter what I did, and I felt frustrated. The problem was that I would eliminate sugar for a period of time, but it would sneak back into my life disguised as ‘healthy’ treats. To be honest, I didn’t miss the grains and legumes in my diet too much, but the sugar was another story. I was desperately missing my old foods, especially the sugar-laden ones, and I found comfort in ‘making over’ my favorite treats. Now, some people who have fixed their broken metabolisms can do fine with paleo treats in moderation. They can eat one and be satisfied. But for me, there is no such thing as moderation. If I had one square of dark chocolate, I would eat the whole bar. If I bought dried dates I would eat the whole bag. If I made a batch of almond flour brownies I could demolish the whole pan in a day. For any treat, I would eat all of it, until it was gone. I couldn’t go without eating something sweet every single day, especially around 3 PM and after dinner. I could usually muster up enough willpower to lay off the sugar when I began to get a little heavier, but inevitably the treats would find their way in again. I found myself in denial again: this time of the fact that even though I was eating better, I was still addicted to sugar and it was controlling my life. I ended up leaving New Zealand in March, moving to Ukraine to live for a year and do some travel around Europe. I hit another major turning point in my life in July. While I was travelling in Ireland, a ‘sugar hangover’ from ice cream and a couple of hard ciders left me feeling sick and horribly depressed. I thought to myself, What is the point of spending all this money on travelling if I’m just going to be in a self-induced dazed depression? I did some quick Googling that night and I found the e-book I Quit Sugar by Sarah Wilson. I read it in one day. I knew that this was what I needed. I was addicted to sugar and I needed to do something about it. I began the eight-week program in Ireland and continued while I was travelling in Spain and France. (On a side note: if I can do it while holidaying in Europe, then anyone can do it anywhere!) After a few horrible days of sugar withdrawal, my head cleared up once again, I was feeling energetic again, and I lost another few pounds, bringing me down to my lowest weight ever. I felt great. And you know what happened? When I came back to Ukraine after travelling, I decided to have a little fruit again and decided I would limit myself to one piece a day. Before I knew it, I was eating fruit constantly throughout the day. My stomach was bloated again, my skin was worse, and I had gained back about 7 or 8 pounds. When I stopped, it fell off again. That confirmed to me two things: One, that it was the sugar that was causing my weight loss plateau. Two, that willpower alone is not enough to overcome the addiction to sugar. My addiction to sugar has been by FAR my biggest hurdle while I’ve been eating paleo. While some people can be perfectly fine eating gluten-free treats and fruit, I just can’t. When I cut out sugar 100%, I mostly lose my cravings and I don’t want it. When I have a little, the dreaded Sugar Monster comes back to life. It’s something about my brain: I just have one taste and I can no longer control myself. I WANT MORE. And without fail, the next day around 3 PM, I want something sweet again and I’m moody if I don’t get it. I have fallen into this trap numerous times with paleo treats, dark chocolate, and fruit. I was in denial because it was ‘healthy’. Now I know that sugar is sugar is sugar, and it is an addictive drug! I find it easiest not to eat sugar when I avoid it altogether. When it’s not even an option, my mind isn’t consumed with thoughts of how much I want it. I’m far from perfect. There are times when I do these things ‘better’ and times when I do them ‘worse.’ I still have some digestive problems that I am working through and am still figuring out which foods I do and don’t tolerate. But I know that when I am careful to prioritize my health, I feel like I’m on top of the world. The reason I’m writing this story, and the reason I’m writing this blog, is because I want to help other people feel like that too. Even though this story and these photos are a bit embarrassing for me, I’m writing it because I want you to know you can find your health through real food, just as I have found mine. It’s possible. If you have already started on a paleo/real food/holistic health lifestyle, I want to encourage you. I know that everything we read and hear about can seem so overwhelming at times. We have an eagerness to implement everything, but we can struggle with feelings of failure. I want this blog not only to inspire you to make your own delicious, nourishing food, but I also want you to find relief in knowing that we ALL have these struggles in our journeys to health! Don’t give up if you ‘relapse’ or find that certain foods have snuck their way back into your life. What’s important is to keep going and to learn from your mistakes. It’s important that you understand what works best for YOU. Better sleep: I rarely wake up in the middle of the night and I sleep much more soundly overall. Sometimes I wake up early in the mornings if I am stressed, but it’s when I have been failing to keep up with my stress reduction habits (morning meditation). More stable emotions: I am more happy, calm and level-headed. The times when I have emotional outbursts are usually when I am a) at the beginning of yet another sugar detox and b) when I haven’t got enough sleep. More stable appetite: I can skip meals or go a long time without eating and not get ‘hangry’. I feel the hunger, and I feel like I could eat, but I don’t HAVE to eat. My hunger doesn’t control me anymore, I control it. And that gives me an incredible feeling of freedom. Easier periods: I no longer need painkillers, which would have been unthinkable before. I have a few minor cramps the first day, and after that it is a breeze. Improved skin: my rosacea and acne have almost completely disappeared, except for when I ‘cheat’ or am exposed to to foods I can’t tolerate. Reduced bloating: This hasn’t completely gone away, but I am much more aware that it becomes far worse when I am eating sugar and fruit. When I cut out sugar, my stomach flattens significantly. Weight loss: To date, I’ve lost a grand total of 38 pounds (17 kg). Change in taste: I was so sad when I first quit sugar, thinking that I would never taste anything sweet again. But, to my amazement, my taste began to change. Now, vegetables taste sweet. Beets and butternut squash are incredibly sweet and taste like dessert! 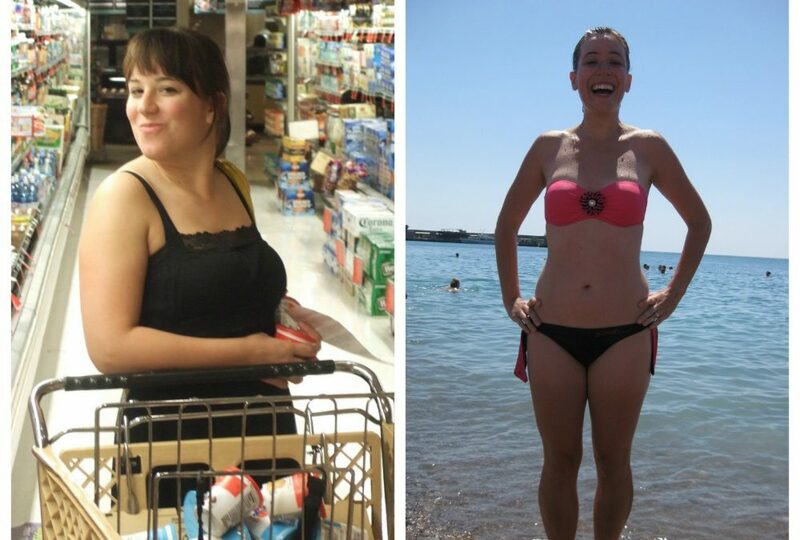 Eating real food changed my life. It can do the same for you. UPDATE 5/31/15: For the past few months, I have been busy working on something new that this entire story led up to! I decided to follow my REAL passion — nutrition — and do an intensive nine month certification course to be a Nutritional Therapy Practitioner! The certification teaches you all about how the body functions optimally, what can go wrong, and how to support the body so it corrects itself. I have started a virtual nutritional therapy practice, Flourish Fundamentals, with my classmate, who I also met in my class, and who is now my much better half. 🙂 I now lead RESTART Program classes, which is a 5-week group sugar detox challenge. You get the benefit of the accountability and support of other people in the class, plus you’ll learn the WHY of the sugar detox and how we can eat for optimal health. You won’t go hungry (in fact, you’ll feel more satiated than you ever have!) and I will walk you through every step of the way with tips and recipes to help you get there. You can find out more about our classes on our website or sign up for one here: The RESTART Program. You can also find out more about the RESTART program itself here. We also do one-on-one consultations, as well as preconception nutrition for couples who want to prepare their bodies for conception. Practical Paleo: If I’ve sparked your curiosity even a little, read this book. If you read just one book on this list, make it this one. I cannot recommend it highly enough. If you are experiencing any particular digestive issues or you have been diagnosed with an autoimmune condition, read this book. There are sections particularly addressing these. This post really resonated with me. It is so real, and encouraging as well. Thank you! I’m so glad. I was hoping to be able to inspire other people with my story so I’m really happy to hear that it resonated with you. Thanks for reading! This was awesome and had me in tears!! I just lost 20 lbs on the Virgin Diet (very similar to Paleo)…the ONLY sugar she allows is two ounces of dark chocolate a day. For the first two months I didn’t even eat that because I was afraid what might happen…sure enough as soon as I did it got out of control SO FAST. Today is the day I am starting over and this post shows up in my inbox–perfect. Gluten and sugar–I just can’t EVER have them. Thank you for writing this! Lisa, thank you, THANK YOU for writing. I am so happy for you that you have made the progress that you have, and I am so glad that the timing of my post worked well with what is happening in your life. I am honored that what I wrote could have helped you a little! I am the same – one taste and I fall off the wagon. 🙂 It’s even happened over Christmas, as you would expect. I’m going to be doing another sugar detox again soon, like you! Best of luck to you, and thank you for writing; it means a lot!